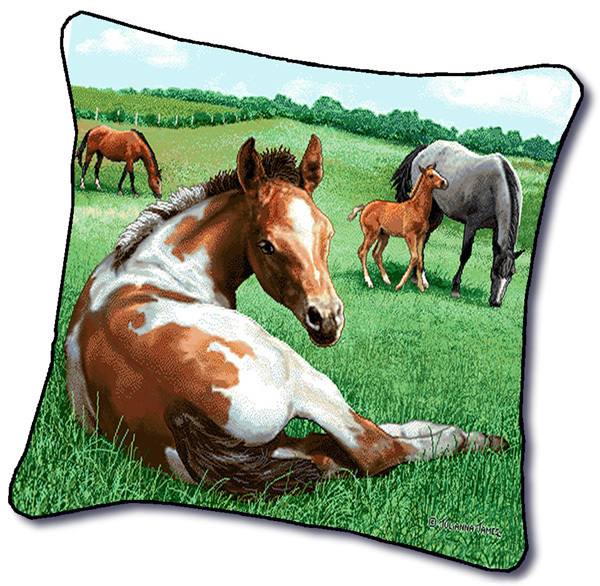 "Horse Tapestry Pillow" Tapestry is woven on Jacquard looms. Over-stuffed pillow. Cotton 100%. Spot clean only. Measures 18" wide x 18" long. Also available: ** 40"x8.5" Matching Tapestry Bell Pull Wall Hanging also available** ** 23"x36" Matching Tapestry Wall Hanging** ** 67"x53" Matching Tapestry Throw* Shipping ONLY within the Continental U.S. Please contact for shipping quote before buying if you live in Hawaii or Alaska. PLEASE NOTE: Shipping ONLY within the continental U.S. Hawaii, Alaska, and Puerto Rico residents please contact seller for shipping quote before ordering.